FREE Keychain faceshield for each participant in my classes! Karrie is an experienced X-Ray Technician and medical assistant for more than 10 years. She is funny and easygoing, and she is very passionate about teaching others about safety and how to handle workplace injuries with CPR and First Aid. Her experience working at several urgent care facilities has equipped her with real-life knowledge which made her a very valuable CPR and First Aid instructor at ZenCPR.com. In this program, students complete the cognitive portion (Part 1) of BLS for Healthcare Providers training through a series of self-paced online modules. Students answer short multiple-choice questions within case-based scenarios, and receive feedback based on their answers, to proceed through 10 critical checkpoints. 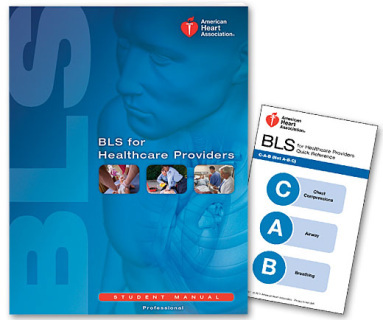 This course provides access to 21 optional review sections, including 17 videos from the BLS for Healthcare Providers video, which reinforce the adult, child and infant CPR sequences taught in the course. 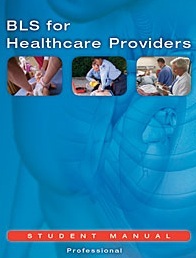 This course is for healthcare providers seeking an Initial or Renewal BLS for Healthcare Providers Course Completion Card. Please Note: Students are allowed up to 60 days after the completion of the online part of the course to complete the skills session. **A printout of a Certification of Completion is Required in order to take a Skill Test. This fee includes an Online Course Web Key, and Free Access to an eBook, and your Skill Test Fee. 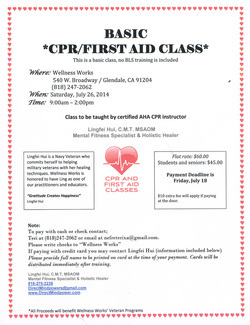 ﻿﻿The Next CPR/AED & First Aid Class at Wellness Works in Glendale will be on Sat/Nov 22, 2014 @ 9AM. Partial of your tuition received from this class will be forwarded to a non-profit organization called Wellness Works in Glendale. The money will be used to help veterans at this center to provide holistic healing and counseling. *** Note: If you do not have a book, $15 extra for a textbook. Learn how to handle medical, injury and environmental emergencies in this 3 hour certification course. Designed for workers requiring certification. 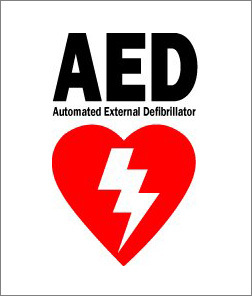 Can be combined with Heartsaver CPR. This is a special rate for those who register in advance. NOTE: For those who would like to Pay In-Person at the Beginning of a Group Class, it will be $35 / person in a Group Class. 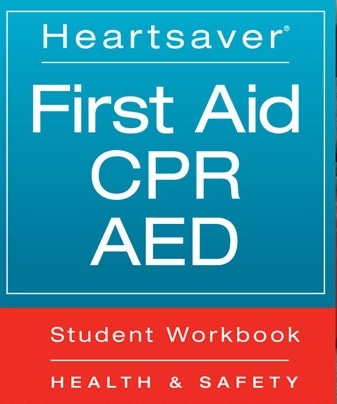 This course is for those who have a duty to respond to a cardiac emergency because of job responsibilities on an industrial safety team, daycare services, Boy or Girl Scout leader. The Heartsaver course teaches CPR and relief of choking in adults and children, and infants. It also goes over the use of barrier devices for all ages. 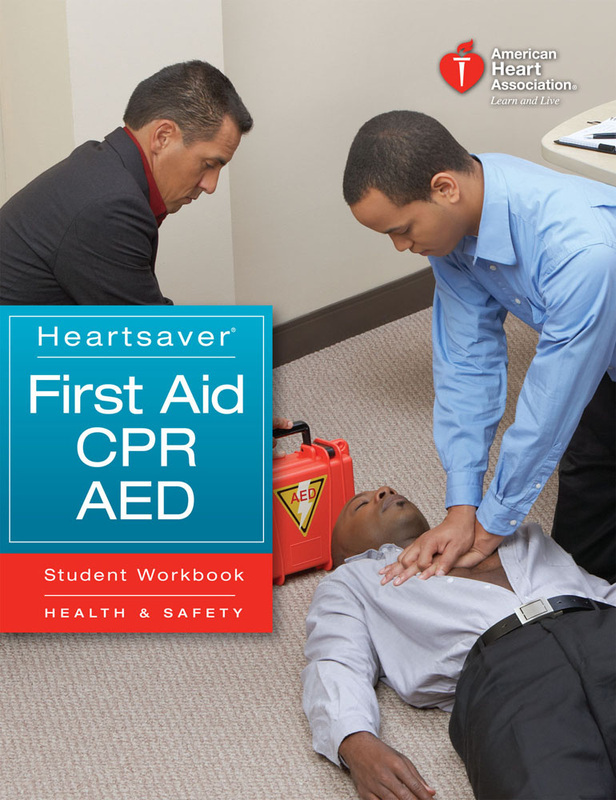 In this course, you will learn CPR/AED, including the use of the AED (Automated External Defibrillator). NOTE: For those who would like to Pay In-Person at the Beginning of a Group Class, it will be $45 / person in a Group Class. Please call Ling at 818-339-4641 or email her to be sure your desired class is NOT FULL YET before you register. 2. Select your class and Pay for your fees below in order to confirm your class. Once your payment is processed, we will send you a confirmation email. NOTE: ALL payments MUST BE received in order to confirm your class! Payments will be processed by PayPal.com. You DO NOT need a PayPal account in order to make a payment. Simply click onto "Add to Cart" button, then you click onto "Checkout" button. You will be guided to credit card/debit card information page where you can make a payment. ﻿This is a wonderful course for anyone that has the responsibility of taking care of someone else including parents, families, teachers, babysitters, coaches or anyone involved in organized sports, personal trainers and lifeguards. NOTE: For those who would like to Pay In-Person at the Beginning of a Group Class, it will be $55 / person in a Group Class. 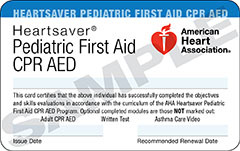 This HeartSaver Pediatric CPR/AED and First Aid course is designed for those who are in Child Care Profession. 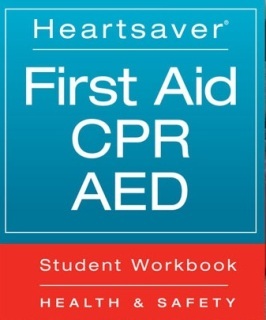 This certification course teaches one and two rescuer infant, child, and adult CPR skills, first aid for choking, bagging, mask, and Automatic External Defibrillator training for the healthcare worker in any setting or healthcare students. $10 from the $35 you pay will go to Wellness Works, a non-profit organization that helps veterans in Glendale, California. For the general public, offices, gyms, childcare providers, athletic trainers, parents, grandparents, and many more. 2-year certification basic first aid, which includes, bleeding control, splinting, treatment of shock and environmental emergencies. For AHA: Cost is $45 and $15 per student will be donated back to a designated organization. ﻿For ASHI: Cost is $30 and $10 per student will be donated back to a designated organization. ﻿For AHA: Cost is $40 and $12 per student will be donated back to a designated organization. **Small Group of 3 people will get a 10% discount.